With research from Harvard Medical School finding regular meditation more beneficial than vacation for its positive effects on health and well-being, and a new host of meditation studios cropping up in D.C., it's never been a better time to try meditation while living in the DMV. Meditation has been practiced for thousands of years and despite the pop-culture images of strictly disciplined Zen monks meditating on high mountaintops, meditation requires no training or strict discipline. It is actually one of the simplest and most foundational wellness practices available. You can practice it anywhere and while doing anything. Meditation is simply the practice of becoming fully present where you are right now. An easy way to slip into the state of meditation is through becoming aware of your breath. Notice the inhale and exhale. For a simple experiment, try this pranayama breathing technique: inhale slowly for 5 seconds, at the top of your breath hold your breath for 5 seconds, and then slowly exhale for 5 seconds. Go through this breath sequence 3 times. Do you notice that you feel different? Time seems to expand when you go into meditation. As you come out of the meditative state, you’ll notice that your mind is clear, there’s a sense of deep peace, and clarity is elevated. Productivity soars and you'll find that you're able to accomplish your tasks with greater focus and peace. What resources are available for starting my meditation practice? You can jump into meditation very easily by using an app like Headspace or tuning into a guided meditation with a spiritual teacher like Gabby Bernstein or Eckhart Tolle. Try starting with something simple like a 5 minute meditation practice every morning before a ritual you already perform daily, such as brushing your teeth or taking a shower. 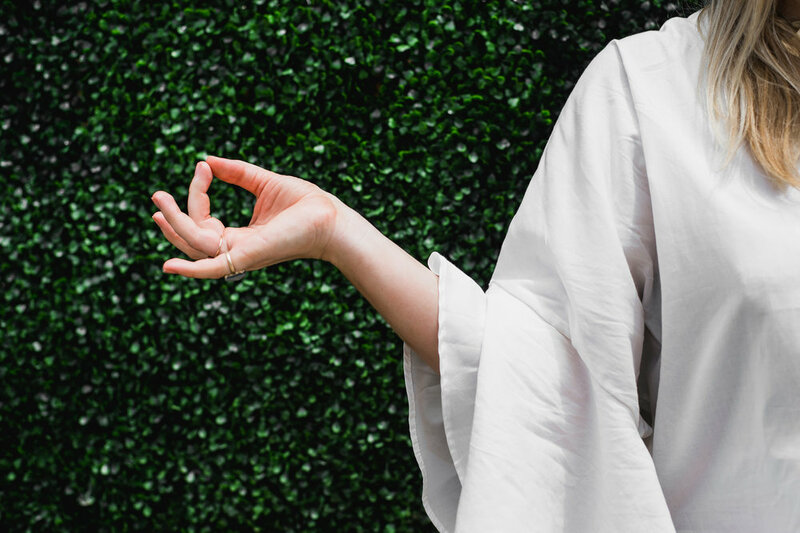 A meditation practice is something that works best when practiced daily, so if you’re serious about reaping its long term benefits, do whatever you can to slip this into your everyday life. I love listening to Louise Hay's evening meditation every night before bed. It sends me off to sweet dreams like nothing else. Any of Eckhart Tolle’s Meditations on Youtube. Here's a good starter meditation. Louise Hay's Morning and Evening Meditations. I downloaded these on my audible app. I highly recommend attending a meditation session in person. There’s nothing quite like the collective energy of being around others in a meditation practice and it can skyrocket you into a deep blissful meditative space a lot faster than when you’re practicing alone. Dubbed "A Modern Meditation and Power Nap Studio," Recharj offers daily classes led by professional instructors for various types of guided meditations, including sound baths and mantra meditation. Power naps are available anytime and include a "Psychoacoustic Sleep System." I tried a power nap during my lunch break during an especially stressful day at my office job and found it unusually refreshing. Power naps start at $9 for a drop in and $18 for a guided meditation. Unlimited monthly memberships are $89. Everyone from Oprah to David Lynch have been raving about their Transcendental Meditation (TM) practice for long enough that it's become mainstream. TM is a meditation technique founded by Maharishi Mahesh Yogi over 50 years ago. David Lynch is so passionate about sharing his love for TM that he even set up the David Lynch Foundation to offer TM to at-risk communities like soldiers with PTSD, sexual assault survivors, and at-risk students. Sign up for an info session and learn more about it before beginning your practice with a guide. Because the practice is individualized, you'll need to work with a guide while setting up your practice, which is practiced for 20 minutes, twice daily. One of my favorite yoga studios in D.C., Flow yoga offers meditation classes that are donation based every Friday from 11:50 am - 12:20 pm. Led by a dedicated practitioner, these classes are some of my favorites in town because of their community feel. Flow Yoga also offers meditation workshops and special classes on a revolving basis. Make sure to keep an eye on their schedule to see what's coming up. Know of other meditation spots in D.C. or want to share resources that have helped you on your meditation journey? Share below! Eat Pretty: 4 Healthy Meal Delivery Services Available in D.C.
City Guide, Wellness, NourishMary Dale March 13, 2018 Meal Delivery, Washington D.C.